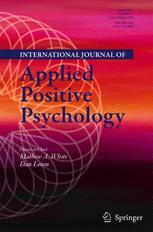 The International Journal of Applied Positive Psychology is a peer-reviewed journal devoted to promoting and integrating evidence into practice from the scientific field of positive psychology. The knowledge stemming from positive psychology can be applied across the lifespan in contexts such as health care, education, working life, communities and societies. The journal emphasizes the scientific understanding of flourishing, more specifically, the practical conditions that enhance well-being and flourishing. The journal is an interdisciplinary forum that involves, amongst others, disciplines of psychology, anthropology, sociology, health sciences, educational sciences, management sciences, design, biology, medicine and economics. We welcome studies that are conducted and reported according to well-accepted guidelines in the research community, such as the CONSORT statement (randomized controlled trials), the PRISMA statement (systematic reviews and meta-analyses), STROBE (observational studies), SRQR (qualitative research) and CARE (case reports). People’s Motives to Participate in a Positive Psychology Intervention with Email Support and Who Might Benefit Most? More than Shared Love: Does Sharing a Passionate Activity with a Romantic Partner Strengthen the Relationship?